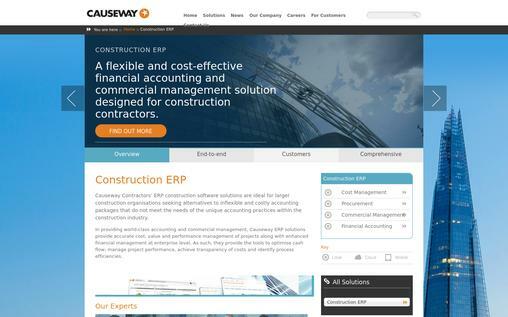 Do you want an efficient way to manage all the costs related to your construction jobs? Construction estimating software is the best answer you can have. They are designed to assist contractors to manage as well as track all the costs associated with any construction job, including highway construction, large civil constructions, or even home repairs. It mainly focuses on assisting you to come up with accurate bid proposals and compare estimated costs in a bid with actual costs related with equipment, materials, subcontractors, and labor once you have won the bid. But the options of software in the market are certainly overwhelming, making it difficult to choose the best. So check out these 10 best construction estimating software and choose the best. 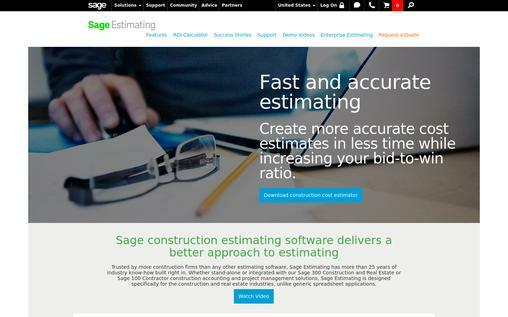 Sage Estimating software is an ideal solution to construction companies, both small and large, providing the flexibility and power to significantly expedite the process of estimating. This software works in virtually the same way you would expect it to, helping to build bids faster and accurately. It comes equipped with cost databases and takeoff among other features. Cut & Fill – this feature helps you determine accurate quantities that are normally difficult to match through manual takeoff processes, meaning less money goes to waste. Database Editor – this is equipped with a set of tools to facilitate streamlined setup and easier maintenance of estimating database. It allows you to add records quickly and update several fields in many records at once. Estimating standard – this feature is purposely built to accommodate the growth of a company, serving as a foundation of what has been proven. Estimating databases – these are a set of databases prebuilt so you don’t have to create yours. They include current manufacturer pricing, parts, and assemblies among others. Takeoff solutions – these allow you to curb risks, save time and boost profits by automating the takeoff and estimating process through pricing databases that are industry specific. Other great features of Sage Estimating include the Schedule integrator, Model Estimating, Estimating viewer, Estimating report manager, and estimating explorer specifically designed for real estate and construction firms. Sage offers price quotations based on your database options when you make a request. A causeway is built to help contractors reduce the traditional costs of tender inquiry by 50 percent and making the net value and costs more visible. This construction estimating software is an advanced tendering solution that can help you create more profitable bid proposals, reduce risks and manage costs effectively. It has a client base of more than 5,000 and mainly suitable for main contractors and specialist contractor under the building, civil engineering and designing. Management of bids – users can effectively determine the best bid amounts. Billing and invoicing – users can produce billing receipts and invoices for various bids that have already been tendered and won. Cost database – this includes a set of databases with current industry-specific pricing for materials, parts, and assemblies. Quote management – enables users to compare the price quotation for various bids so as to present the best possible quote to win bids. Subcontractor management – if dealing with subcontractors, it becomes easier to manage their costs of performing specific contracts. Causeway does not offer pricing for its software, so you can receive a quote by making a request. 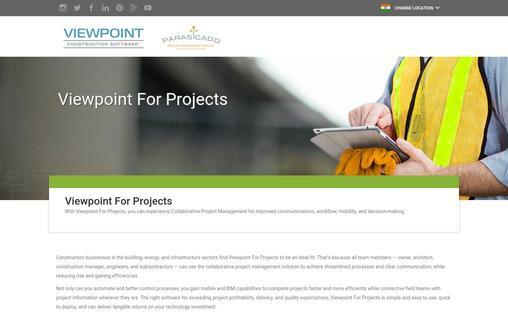 The viewpoint for Estimating is a software designed for small and medium-sized contractors to leverage the technology of digital takeoff and eliminate cumbersome, costly and low traditional planning approaches. It features pre-built databases to help you determine the costs of equipment, materials, and labor based on the industry standards and units. Cost database – lets you cost any job appropriately by considering factors like weather conditions, full time, seasonal labor and skill level. Quote management – allows you to factor in all negotiation issues so as to determine the best quote to present to owners after winning bids. Project estimation – you can easily determine the labor, materials, tools, and equipment for any type of construction job. Manage Sheet Revisions – this allows contractors to compare old plan with new one to quickly determine the changes that can result to additional costs. Shape Recognition – this automates the quantity counts through searching for plans and interpreting shapes and symbols to improve accuracy and save time. The viewpoint of Estimating provides a solution for specialty subcontractors, civil contractors, general contractor, and owners. Pricing is offered upon requesting a quote. HCSS HeavyBid is an estimating and bidding software specifically designed to meet the needs of construction firms. It helps more than 35,000 estimators on a daily basis in creating flexible estimates as well as managing bids efficiently. It uses data from multiple sources and automates any repetitive tasks. Users are enabled to review as well as edit estimates with ease and determine best prices. HCSS HeavyBid I suitable for all companies of varying sizes under industrial construction power, transportation, and utility. Quick estimates – uses data from multiple sources to help you create estimate faster. Flexibility in building estimates – estimates are made to be independent thus enabling users to customize when structuring. Automatic identification of errors – HCSS HeavyBid can automatically identify potential sources of errors in estimates and redirect you to correct those errors. Multi-level breakdown – enables users to subdivide complex tasks into smaller and detailed pieces for easier management. Subcontractor management – enables you to quickly analyze suppliers and subcontractor quote o at choosing the best option. Contractors can request price quote since HCSS does not provide pricing to the public. Demos are also available upon request. 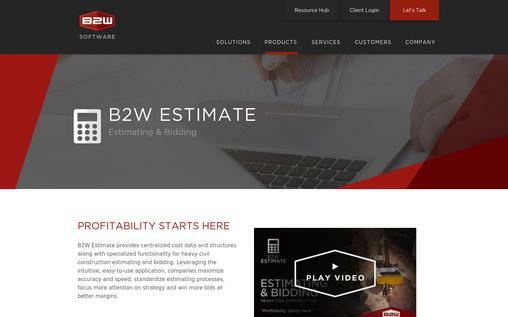 B2W Estimate is a cost estimating and bidding software specially designed for heavy construction firms or contractors. 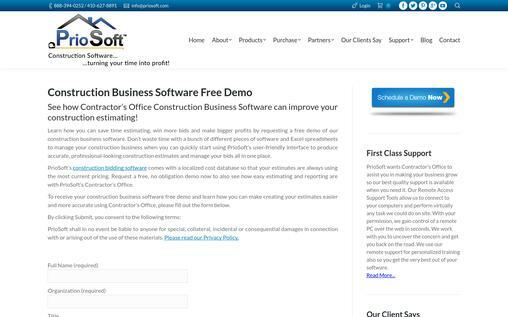 It’s a great software that can be used to calculate labor and material costs, track subcontractors and suppliers, manage bids and quotations. It offers Excel integration support and can also integrate with other project management and accounting systems such as Oracle, Dexter + Chaney, Maxwell Systems among others. This construction estimating software is purposely designed for earthwork, utility, paving, highway among other heavy construction contractors. Easy deployment – it is quite easy to use and deploy as it features an intuitive interface and construction estimation logics. Databases – features a set of a database with specialized functionalities for building bids from cost structures. Export capabilities – since it can integrate with other systems, it supports export to accounting, field tracking and project management systems. Robust performance – designed with .NET and SQL to provide high performance and scalability to run complex features and accommodate future expansions. Work breakdown structure bidding – enables firms to develop and organize estimates in boundless hierarchical forms. Price quotation is not provided but can be obtained by making a request. ProEst is a renowned developer of construction estimating software with about 40 years of industry presence. This software integrates digital takeoff, cost estimating and bid analysis in one package. It has been built using the .NET platform and Microsoft SQL database. It features materials database and cost update service support such as RSmeans, All Prier and Trade Service. It can also integrate with other project management and accounting systems. It is recommended for use by large constructions firms with at least $1 million in revenue per year. It suits specialty subcontractors, homebuilders and highway contractors among others. Cost management – presents users with the ability to refine every bid and run the “what if” analyses to ensure that estimates are both profitable and competitive. Comprehensive material database – this features cost update service such as RsMeans and All Priser. Intuitive interface – built with the look and feel of Microsoft Office for a simpler learning curve and usability. Digital takeoff integrated – this gives users flexibility in performing takeoffs on screen by using a mouse and electronic blueprints. Support for various file formats – including AutoCAD, TIF and PDF. Customizable database – this makes it suitable for all sizes of contractors. ProEst is suitable for general contractors, concrete and masonry, residential, specialty subcontractor, electrical, mechanical and landscaping firms. It is available in three editions; Standard, Professional, and Enterprise Price quotation are available when you contact them. 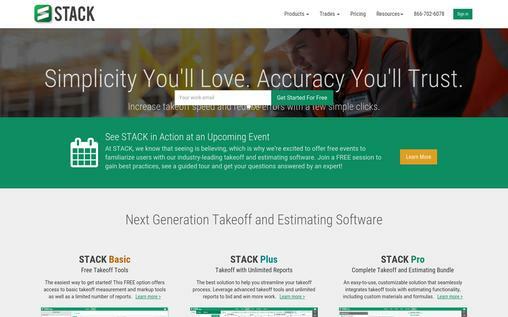 TACK Estimating produced by STACK construction Technologies is a takeoff and estimating system for contractors of all sizes under various industries. This construction estimating software allows users to create bids that have user-defined prices thus enabling them to accurately calculate costs. Users can also execute takeoffs on their own or simply request STACK to handle the task through the STACK To-Go feature. It also offers pre-built catalogs that include equipment, material, and labor depth lists. Reporting – the reporting module enables organization of data based on division, location or trade. Cost estimates – featured with coverage rate calculators that help in determining the type and number of materials that will be needed for a project. Pre-built catalogs – available for certain trades and include in-depth lists of materials, equipment, and labor. Cost database – determine the best cost estimates for a project by using material, labor and equipment prices from specific industries. Wide platform access – can be accessed by computers as well as mobile devices. Takeoff – provides a better and accurate ground for project takeoff. STACK has offers users a free trial period before purchase and a starting price of $199.00 per month for a single user. Three editions are also offered; Basic, Plus, Pro and Enterprise. It’s pricing also includes plans for multi-users. 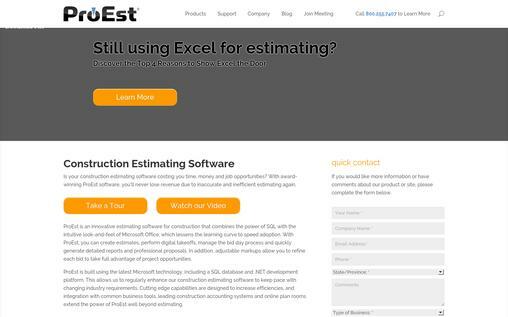 It’s a suitable estimating software for contractors working in any trade, from interior finish to concrete and masonry. 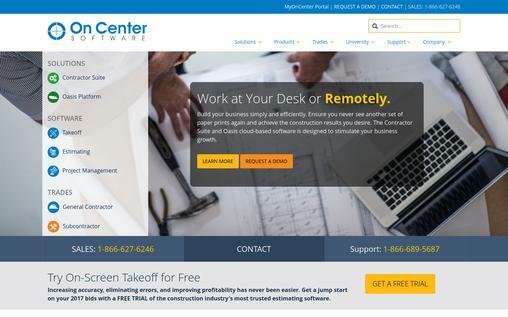 On Center Software is a construction estimating software that features Quick Bid and On-Screen Takeoff, having been put into use by many companies worldwide. It is suitable for both residential and commercial contractors across different trade types. On Center Software can effectively serve medium and large sized construction firms. It does not have any limits regarding a number of users who can be added into the system. Takeoff application – this offers on-screen takeoff support and digitizer integration. Also supports file integration as well as 2D takeoff. Cost databases – makes it possible to determine the best quotes by trade. Integration support – it supports integration with other systems including project management and accounting platforms. Cost management – compatible with the tablet technology which offers field access to data for efficient management of labor and costs. Estimating – allows users to estimate the best quotes to present for winning bids. On Center Software provides users with a free trial before opting for a purchase. Price quotation is offered upon request. This software can help contracting firms to boost their profit levels up to $1 million annually. Contractor’ Office was built to cater for contractor’s estimating needs in various industries. It has capabilities and features that make it suitable for both residential and commercial contractors in a number of trades, including the electrical, plumbing, site work, HVAC, real estate developers, and general contractors. It features bidding and estimating, project scheduling and management, customer management as well as accounting applications, all in one suite. It facilitates the presentation of estimates in a more professional way by producing detailed estimate reports whenever firms place their bids on projects. Bid management – helps users create detailed estimates of projects that can help in winning bids. Cost management – when a bid is won, the software helps contractors keep them more profitable by comparing and monitoring actual costs to set budgets. Accounting support – this makes it easier to create invoices and billing for clients once projects are completed. It also provides AIA billing system where clients build according to the percentage of project completed. Project management – makes it possible to present project proposals on time and within budgets. Reporting – it features an easy to use interface for users to create various types of reports on their projects or bids. Contractor’s Office mainly targets the small contracting firms with less revenue per year. It also provides flexibility regarding the operating system being used. The pricing plan is availed on a monthly plan or on flat rates, but a 15-day free trial is available for download a well. 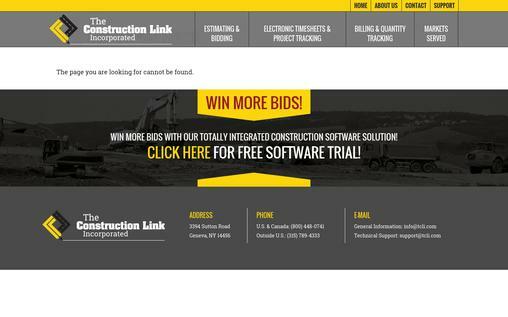 The Estimating Link is an estimating software solution by The Construction Link Incorporated. 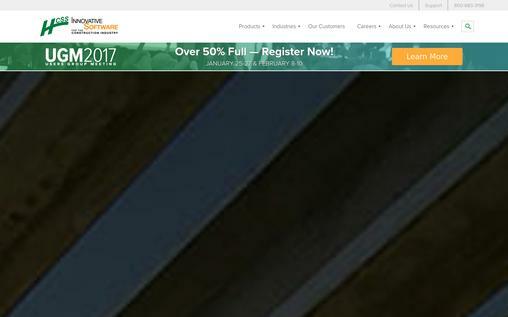 It is built to cater to the estimating needs of general construction contractors of both small and large-sized firms. It’s ideal for a wide range of construction trades, including heavy highway, site work, bridge, environmental and civil works. It’s an adaptive software that integrates estimating, billing, quantity, and field tracking in a single software suite. Its suitability for small jobs is supported by the fact that it does not any special setups. Users can easily use the bid items from a previous job. Accounting support – this software features an accounting system support with support for multi-users, allows task estimation by hours or days. Scheduling system interface – it allows users to export data to various scheduling interface including Microsoft Project. Built in-digitizer takeoff – allows users to place their blueprints on digitizer board and perform takeoffs by tracing area on the blueprint. Subcontractor management – allows you to compare the prices of various supplier and vendors to determine the best quotes that are profitable to a project. Bid management – supports the balancing of a bid, enables users to place lump sum as well as unit price bids. Estimating Link offers two pricing plans, including the Single user license and Multi-user licenses. Price quotes are obtained by making a request. Finding the best estimating software out of these ten options will require you to delve into each software option and consider the feature and budget that are suitable for your construction needs. Most of them suit contractors from various industries and sizes, so finding one that best meets your contractor needs to win bid easily won’t be much of a big deal. What if we make you familiar with an astounding promotional tool for real estate/construction business? Yes i.e. MailGet Bolt – Email Marketing For Construction Companies & General Contractors.